1. Mix the potato sticks with 1 1/2 tblsp of oil. 2. Toss well to coat and place them on a baking tray. 3. Bake them in a preheated oven at 450F for 8 to 10 minutes on each side, until crisp outside and cooked through. 4. In a small pan, mix the remaining oil with garlic and cook till garlic starts to brown, for 1 to 2 minutes. 5. Transfer the fries to a plate. 6. Sprinkle generously with salt and drizzle the garlic on top. 7. Sprinkle parsley and serve as a snack. 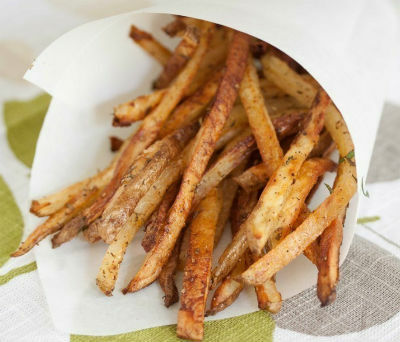 Feel free to comment or share your thoughts on this Oven-baked Garlic Fries Recipe from Awesome Cuisine.